[Image: Science Building, London, England, 2003, by Carl Zimmerman. From Landmarks of Industrial Britain]. In two beautifully realized and conceptually fascinating projects, Canadian artist Carl Zimmerman creates "architectural utopias, fictional ruins from fictional worlds." [Image: Archives, Leeds, England, 2002, by Carl Zimmerman. From Landmarks of Industrial Britain]. Zimmerman's Landmarks of Industrial Britain, for instance, is "a photographic series of fictional public buildings derived from small scale architectural maquettes." As the Art Gallery of Nova Scotia explains, the series "envisages a worker's state in Britain at the time of the Industrial Revolution." Zimmerman himself writes that his work preys upon "the apparent willingness of the viewer to accept a fabricated past." In the process, the lost industrial utopia he's created – a false history convincingly rendered through the use of immense landscapes and architectural monumentalism – comes to look like a world designed entirely by Etienne-Louis Boullée. [Image: Museum, Birmingham, England, 2002, by Carl Zimmerman. From Landmarks of Industrial Britain]. 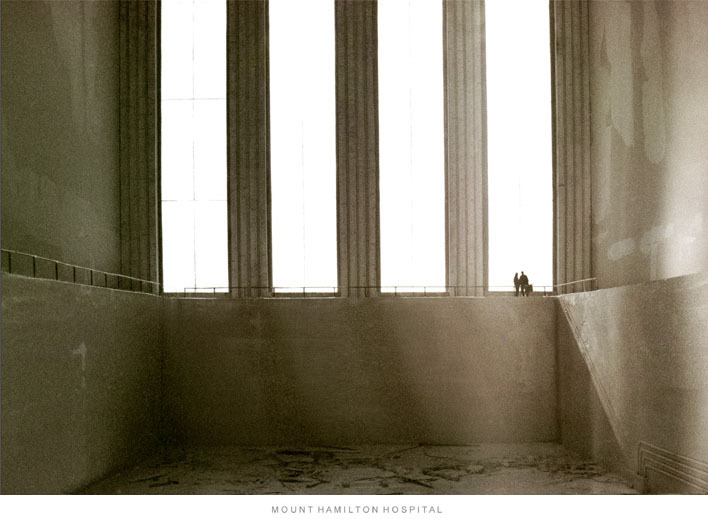 Zimmerman's earlier series, Lost Hamilton Landmarks (referring to Hamilton, Ontario), apparently kicked off the artist's ongoing interest in "Greek and Roman [architectural] prototypes." 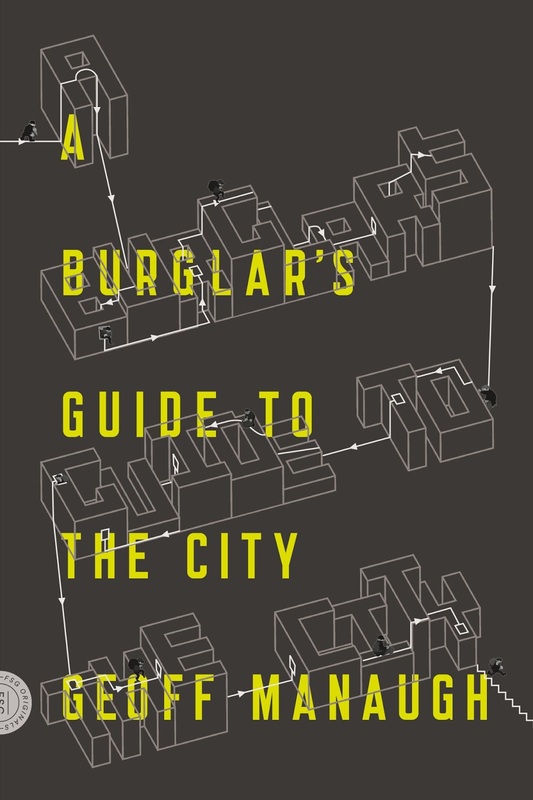 This "neo-classical architectural language," Zimmerman writes, attains much of its aesthetic power by "appealing to state authority and to instinctual desires for permanence and stability, security, sense of place, or even to the desire for the guidance of a parent." 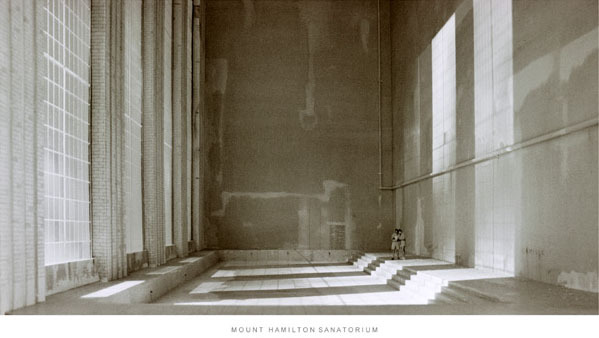 [Image: Mount Hamilton Sanatorium, 1995, by Carl Zimmerman. From Lost Hamilton Landmarks]. Zimmerman thus uses the authoritative language of neo-classical architecture to help convince his audience that these buildings once actually existed – and that they now stand ruined somewhere, cavernous, sublime, and empty. 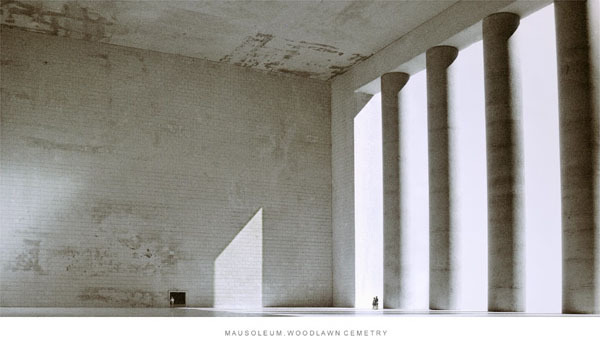 [Images: Mausoleum, Woodlawn Cemetary, 1996, and Mount Hamilton Hospital, 1996, by Carl Zimmerman. From Lost Hamilton Landmarks]. After all, these are not real buildings. [Image: Public Baths, Manchester, England, 2000, by Carl Zimmerman. From Landmarks of Industrial Britain]. 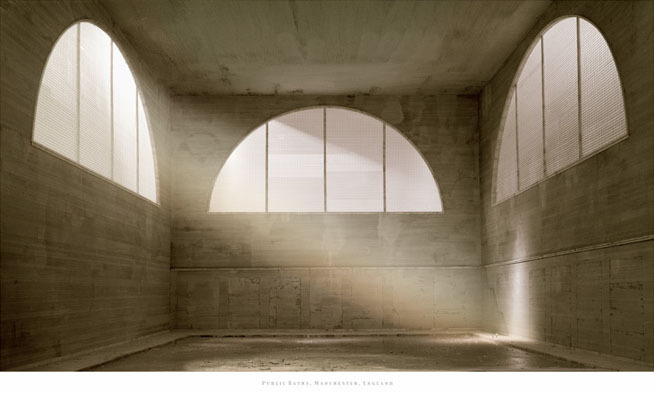 [Carl Zimmerman] makes photographs of imagined architectural spaces. He builds models, photographs them, and then digitally manipulates the photographs, creating vast, impossible spaces. Sepia-toned and laid out flat on tables in the gallery space, the photographs read, at first glance, like historical documents – they feel very much like 19th century architectural engravings – until you realize they can’t be because they’re all dated in the present. A closer look reveals that the buildings are set in huge, almost surreal, bleak landscapes – their titles want you to believe, however, that these buildings are plunked down in ordinary cities like Manchester and Leeds. Zimmerman's show at the Art Gallery of Nova Scotia appears to be over – but if it is still up, I would strongly recommend stopping by. Zimmerman's models were on display alongside the photographs, and the exhibition sounds like it was well worth seeing. What seems particularly interesting, to me, is that Zimmerman achieves a sense of near-total ruin, but he does so not through the depiction of structural collapse – he simply shows us grandiosity and silence. [Image: War Memorial, Leeds, England, 2004, by Carl Zimmerman. From Landmarks of Industrial Britain]. If you're feeling well-heeled, meanwhile, consider buying yourself some full-size prints of these images; you can do so at the frankly named buynewart. You can also see more deeply colored versions of Zimmerman's work by visiting Toronto's Stephen Bulger Gallery. (Thanks, John Devlin! 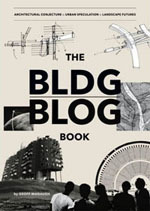 See also BLDGBLOG's earlier look at the work of Oliver Boberg and Thomas Demand). sorry - I can't find a decent link to images of the place! Thanks for the interest in this exhibition. Also you may be interested in our next exhibition Graeme Patterson: Woodrow which is a series of installation pieces from the small town of Woodrow that are models that are both real and fictional. If interested I will forward imagery and text from that exhibition. Visions of Ingsoc: bleak and dehumanizing. Brutalism looks positively appealing in comparison. These also bring to mind the lighting and composition used with Speer's Germania models. Just a quick note: the link at the very end of the original post up there was supposed to say "the work of Oliver Boberg and Thomas Demand" - which it now does say - but Joerg Colberg's comment came before I fixed that (it only said "the work of Thomas Demand"); sorry about the confusion - and thanks for the other Boberg links, Joerg. And, Jeff, I'd love to see the images and text from the Graeme Patterson exhibition; you can reach me via email when you get a chance, or I'll drop you a line. Thanks! models of prison typologies and interiors, and photographing them, for quite a while. I got to know him in a collaboration back in 1992, in which I did some digital renderings of prisons in SoftImage. Jim's work is mysterious, sombre and evocative. Quite beautiful stuff. Hey Ed - Any examples of the prison renderings online? Sounds good. Glad to see the thoughtul comments. I'd like to identify myself as the guest curator of the exhibition. 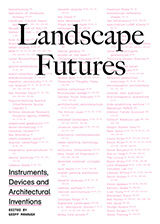 The catalogue that accompanies it includes essays by myself and AGNS Senior Curator Ray Cronin. I also curated an earlier (1997) project of Carl Zimmerman's work, which included the series Lost Hamilton Landmarks, at the gallery where I am now the Director/Curator, Saint Mary's University Art Gallery in Halifax, Nova Scotia, Canada. Bookworks from that exhibition are still available.